While the title of this week’s blog isn’t an official tagline or slogan for Stellar Signs & Graphics, it could certainly serve as one. It’s an apt way to quickly describe the signage expertise embodied by the talented members of our team. We pride ourselves on offering South Floridian businesses the opportunity to vastly improve their reputations with the addition of new onsite signage. And, as you’re undoubtedly aware, signage comes in many shapes and sizes. Just a shortlist of our specialties includes storefront channel letter signs, monument signs, lobby signs, vehicle wraps, window graphics and lettering and wall murals. So, yes – you can literally name the type of sign you’re looking for and our team will get to manufacturing it with the highest possible quality as the outcome! 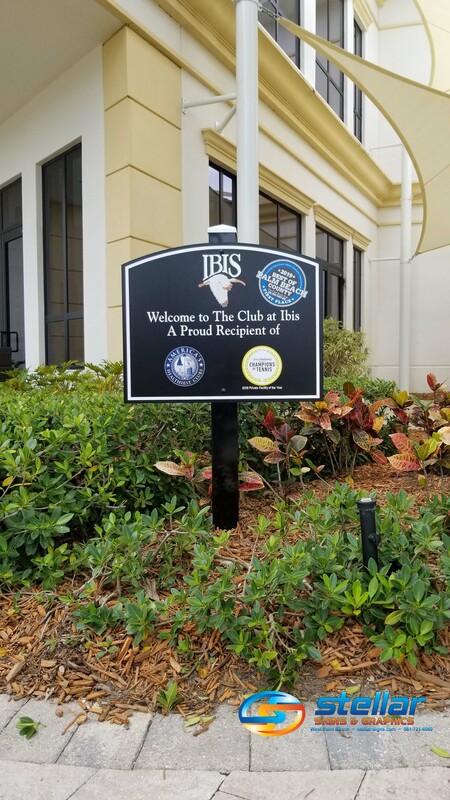 We recently had the pleasure of working with The Club at Ibis! The above photo above showcases a brand new welcome sign for The Club at Ibis’ fitness center. You’ll notice the “2019 Best of Palm Beach County” decal. We also added that decal to another welcome sign for The Club at Ibis that we had completed years ago. The decals, added to the clean and professional design of the sign, help to communicate the prestigious nature of the club. As their website describes, “Ibis is a private West Palm Beach Country Club conveniently located within the high-energy lifestyle communities of the Palm Beaches, just seven miles west of I-95 on Northlake Boulevard.” The property is made up of 33 neighborhoods over 1,923 acres. It currently has 1,840 residences with 1,864 more proposed. We also completed a new post and panel sign for Ward Real Estate! 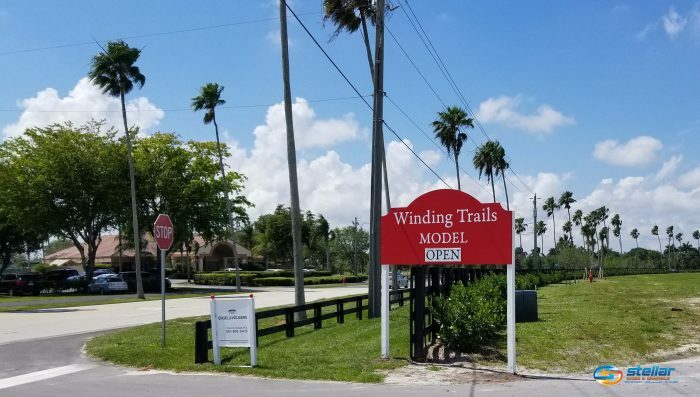 As you can see in the photo below, Ward Real Estate’s Winding Trails post and panel sign has a repositionable open/closed sign. Naturally, this is a very important feature for communicating to the general public the hours within which a business operates. Post and panel signs are excellent, cost-efficient ways to alert drivers and walkers-by of the location of your company. They can be very easily installed and then removed to be installed in new locations, making them ideal choices for real estate companies that have various open house events in different communities. Which type of sign would best suit the current needs of your company? The experts at Stellar Signs & Graphics serve the business communities in and around Palm Beach County, West Palm Beach, Royal Palm Beach, Wellington, Lake Worth, Boynton Beach, and Greenacres, Florida. Please don’t hesitate to give us a call at 561-721-6060 today!